The first exterior lime coat went up at the beginning of this week. It definitely feels like a milestone to be using a new material, not to mention completely transforming the exterior of the building. I remember learning about the lime cycle at school, and specifically remember being told that it was used “in industry”. This doesn’t leave much scope for the imagination of a fourteen year old, so I promptly forgot all about it. Lime plastering, on the other hand, is a perfect, tangible example of this process. The word “lime” is used fairly broadly to include several different products derived from limestone. A sedimentary rock composed of the skeletons of tiny marine creatures, limestone is mostly made of calcium carbonate. When heated this breaks down to form highly caustic calcium oxide – or quicklime – and carbon dioxide. When mixed with water the quicklime becomes calcium hydroxide, or hydrated lime, which is what we use in our plasters. As the plaster dries, the lime reacts with carbon dioxide in the air, completing the cycle by turning back into calcium carbonate, essentially coating our walls in durable rock. It doesn’t look too shabby, either. 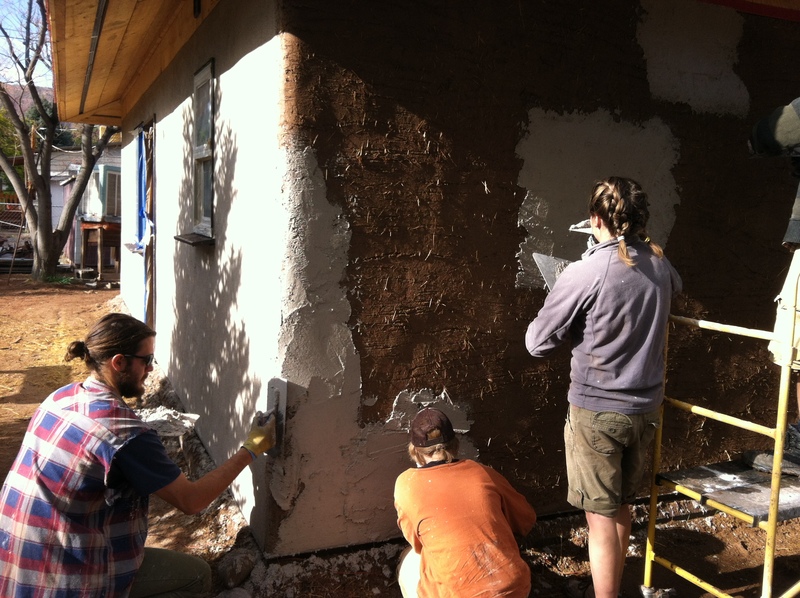 Fun with lime plasters at Community Rebuilds in Moab, Utah!